I worked in the food serving industry for about a year while in college. And during that time, I’ve tried many different kinds of food. Quiche is probably one of my favorites. I have the tendency to make my food in layers. I once made a potato pie with 2 layers of ground beef, cheese, mashed potatoes, parsley, thyme, more cheese, and topped it with bacon and cheese. Yes, unhealthy, but delicious nonetheless. I adapted the recipe from BudgetBytes. She’s one of my favorite websites to go to. Of course, her recipes are cheap, and delicious. *Note that this is the vegetarian option, for meat, add some ground beef/pork/bacon or substitute the layer of spinach with meat. I bought whole monterey mushrooms since they are cheaper than sliced ones. I sliced them up while warming up a skillet with olive oil. Put the mushrooms in and mince up the garlic. Put in the garlic, pepper and salt with the onions. Saute them all together for about 5-7 minutes until there’s no water left in the skillet. (So it won’t be soggy when you put it all together). 2. While waiting for the mushrooms to saute, squeeze the spinach dry. I covered the inside of my Pyrex bowl with a thin layer of olive oil. 3. 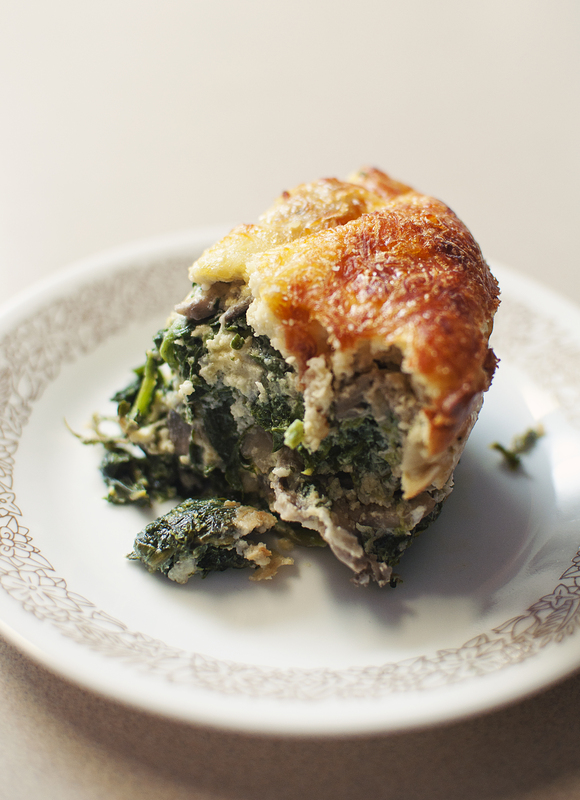 As for the custard, mix the 3 eggs, milk and 1/4 cup of parmesan cheese in a bowl and pour it on top of your delicious layers of spinach, mushrooms and cheese. 4. Lastly, add a handful of mozzarella cheese. Yes, I love my cheese. Put into oven for about 45 minutes to an hour. There’ll be a beautiful puff and it’ll slowly deflate as you take the bowl of deliciousness out of the oven. P.S: I also have the habit of sticking to one recipe for weeks before switching. I’ve been alternating between spicy hotpot and baked drumsticks for the last couple of weeks (throw in a potato salad and rice krispie bars in there as well).